For more information on the benchmark, hardware limitations and verification requirements, please refer to the specific competition pages. HWBOT Team Cup 2013 - SC4: "Live Performance"
1x CoolerMaster "unreleased 1000W performance PSU"
1 February 2013 - 30 April 2013: HWBOT Team Cup 2013 - SC4: "Live Performance"
The Seidon 240 is Cooler Master’s latest, incredibly compact watercooling kit that aims to bring watercooling to the masses. It comes factory filled, sealed and tested with a two year zero maintenance guarantee. The performance 240mm radiator is designed for dissipating huge heat from overclocked CPU. Thanks to a 120mm PWM fan with a wide RPM range Seidon can operate silently or unleash a powerful cooling storm at your command. Factory filled with coolant, then sealed and pressure tested - requires zero maintenance for years. Waterblock made with UltraFine Micro Channel enlarge the contact surface between cold plate and coolant. Durable and powerful water pump – dissipates heat effectively and maintains temperatures through stable water circulation. Performance 240mm radiator is designed for handling high wattage overclocked CPU. Double 120mm PWM fan with a wide RPM range to fine tune and balance fan noise and performance. Built for quality and performance, the Silent Pro M2 1500W utilizes dual 12V rails that boasts a significant increase in available power output per power supply model over its predecessors. It translates into increased total amperage, high quality components to increase efficiency, environmentally friendly RoHS and ERP 2010 Certifications, and a long life 135mm fan with a durable Hydraulic Dynamic Bearing that decreases noise. CoolerMaster "unreleased 1000W performance PSU"
Meet MIL-STD-810G standard to ensure the best stability and quality. The XPG (Xtreme Performance Gear) SX900 solid state drive is an expanded capacity SSD which uses new optimized firmware to utilize greater storage capacity of the NAND Flash components. With superior NAND Flash, the XPG SX900 SSD reaches new levels of stability and performance. The drive breaks new ground in storage capacity for SSDs utilizing the SandForce 2281 controller, a 7% increase over common SSDs in the market that use a SandForce controller. This represents a milestone in ADATA’s history of NAND Flash based products. Read and write speeds 550/530 MB per second. Maybe my doubt is a bit silly, anyway... About the live stage, what's exactly is the "event report"? For example, An video footage or a new thread on forum talking about the event count as this "event report"? i7 930 is not allowed? An aftermovie or a thread with lots and lots of (resized) pictures can be considered an event report, yes. The most important part is that you can show the score was done live and surrounded by people other than yourself or your team mates. - background is coming up! Can we submit without a background? Two subs already? A verification screenshot is required. Please attach a picture of your overclocking rig. Seems a bit silly to launch competition but not background. when background link available.. ? mumpung ada.. submit dulu sebelum di jual.. he.he.he.he.he. It's exactly same silicon as Clawhammer. A64 FX-51, 53 and socket 940 opterons use this core. W3520 (C0/C1), W3540 (C0/C1), W3565 (C0/C1), and W3570 (C0/C1) allowed for Bloomfield? Why not just say all C0/C1 Bloomfield? i think you try to submit, if not allowed, it will be warning by the form..
AFAIK, no RETAIL xeon w3xxx C0/C1 chips exist, therefore those xeons are not allowed. All Xeon Bloomfield were 2009 release, afaik. Can 3800+ Clawhammer be added to the competition. It wasn't in the database until Turrican just added it, submission don't work with it. Just got a complaint from a friend (who doesn't speak English) that you can't submit P4-505 into '2004 stage even though wiki says that it was released in December that year. The Vantage and 1M stage have a bit more options because it's sometimes unclear what core will be the fastest. For 03 it's mostly quite clear. Sandy will never beat Ivy or SB-E in Vantage, so there's no point to add them. In the live performance stage, we will be a little more relax on the approval of submissions. The idea is that you bench if front or surrounded by people that don't know much about overclocking - if that criterium is met, the score will be allowed. What we want to avoid is people posting scores done in the garage with 2 bypassers checking out the system. Was that one actually released officially? mantap kang placid, lagi berburu hardare lagi nih..
Westmere-EP allowed? X5650, X5660, X5670, and X5680 were all released in 2010. Why no 6800 GT PCI-e??? Awaiting for confirmation from Coolermaster, will update info soon! just check the others bencmark, many of them not visible too..
http://hwbot.org/submission/2356445 --nothing wrong with it. http://hwbot.org/submission/2356891 --removed already, but there is nothing wrong with running Feature/CPU test, you are allowed. I can only do them one at a time, rest assured all will be checked and validated. with sub test, my submit block by SWEET..
Do you have a link? Im sure it was a misunderstanding. X5690 launched in Feb. 2011 so its outside the rules of the stage. Going to update tonight along with adding prizes from G.SKILL, ASRock and MSI! Which one is the proper category to submit results for a Plain (NV40) 6800 AGP 128MB ??? At the same category , along with the 6800 GT's and ULTRA's ??? Lima core Athlon 64 3800+ CAALG stepping allowed? GT and Ultra have their own category. The category Mr.Scott linked you to is just for the 6800 AGP (the normal one). That CPU was released in 2007, so not applicable for the Cup. "At the same category , along with the 6800 GT's and ULTRA's ???" Am i doing something wrong , or is it somekind of problem others might have also ? By the way a deticated moderator should check the hole 6800 category cause i see soft-modded and bios modded cards @ 16 pixel / 6 Vertex ... all over the place. What if you type "GeForce 6800 GT" ? When i type "6800 GT" , it shows me the options of GT's and GTO. Shouldnt it be more correct , when typing "6800" to show you all the related entries ??? Brace yourselves, Team Cup me voila! 21 + 22.2 + 29 + 35 kg of Hardware I did bring from my old living place to my new one by train. HWBOT staff, can we get a rules clarification and update for the Northwood processors? Right now, the competition stages list Northwood P4 2.8 and 3.0 chips as legal. But they don't specify that these need to be the Northwood 'A' 100 MHz FSB chips, as opposed to the Northwood 'C' chips with 200 MHz FSB and HT. The 'C' chips were released in 2003 and should be specifically disallowed. I mention this because numerous submissions have been made with 'C' chips and if those are disallowed (which they should be by the rules), the competitors need time to generate new submissions. If this is already being addressed then I apologize for the redundancy. It is being discussed, please wait for an official statement. Even if you are right - and i don't have any reason to believe that you aren't - it's not right to change the competition rules just before the end of the competition. Just 15 days left and this competition started two (2) months before. So pls don't discuss for it. Leave as it is even if it is a bit wrong. Given the lack of any official statement, I'm assuming that they're allowed. Because, as you point out, Varachio, time is probably too short now for people to come up with new subs. Sign. Same case here. Pentium 4 3.00Ghz (FSB 200) even stands in the list of CPU's that are officially allowed at the SPi1M Stage and it's also listed as allowed in the 3DM03 History Stage. So - what's the final descision?! Can i use the CPU or not? I want to bench further at the weekend, but i don't want to spend 30h in benching and get results which will be deleted or won't count for the team-cup... then i can use my rare freetime for other things. It's a little bit to late to discuss this question isn't it?! 14 days left, every one has to buy and bin other CPU's - so our problem? I don't want to attack the staff, everybody makes mistakes but in my eyes it would be really unfair to say that they are not allowed - 2 weeks before ending of the stages. What do you mean with cleaned, submissions removed ? So after cleaning, i see Pentium 4 3G (FSB 200) is still listed and the submits are in the ranking - so it must be allowed to submit with it. Thx (but still would be nice to get a clear answer about this). I don't have an answer for you, but I'm sure Massman will understand it is a little bit late to remove it. Okay, thank you very much GENiEBEN. It's never too late to correct a mistake !!! ... and it's more fair for the people that used the proper hardware. But if you need to buy a CPU, Board and the vga -everyone would buy what he thinks that it is the best choice. So you check the list and you see: oh 3Gigz FS200 NW - sounds good, go buy it. You double checked the list: okay CPU is allowed - hit the "buy" button, done. Then you make several testings and submit results, everybody see's the results, some say: good one (maybe even staff) and you are happy. Then, round about two weeks before end of challenge, someone says: "Hey, was our mistake but we have to delete your results. Yes we know, not much time left but then you have to try harder and buy some more CPU's." That doesn't sound fair in my eyes and of course you (TASOS)are right, for all the guys who didn't use the specific CPU('s) it's also a little bit unfair but i think vice versa it's a little bit more unfair. I think so, why e.g. i didn't chechekd on my own when the P4 3G (FSB) was released, cause i thought i can rely on the list and rules - so why i have to double check this? Edit: Sign Leeghoofd - same thought's on my side. For me it was clear from the start. In any case i (or my team members) had any doubt , i asked or doublecheck release dates and related parameters. Below in red highlighted , is the key factor of this competition. The main theme of the Team Cup 2013 revolves around high-end performance since the beginning of this millennium. We took the most high-end components available at every second year, starting from 2000, and build a competition around it featuring the benchmarks SuperPI 1M, 3DMark03 and 3DMark Vantage. That's my opinion ... that's where i stand. Double sign. Why we had to check when the CPU's were released if there is official statement in form of a list of allowed CPU's? Is that the one with 15,3 multi? how about 2.8 200 northwood? i have a Amd phenom II 560BE (Callisto) when i unlock it , it will be "Deneb" ,can i use it in 3dmark03 in this stage "#6: 2010: Gulftown vs. Deneb " ? Ofc, I have so much to bench this weekend... won't have time for all of them. Still no 3D benches at all. I am still benching to improve my 1m scores and I did want to do some 3d as well. 20 days ago I thought I had plenty of time to bench but now I wish we had a few more days!!! You have 1 more evening I still don't have any 3D scores and 3 1M systems are waiting, too. ^ First link does have the official bg as you can see thru the aero interface Since he is a team member I will let others decide. ouch LOL. it was for the cup..
You said allowed here, but I cannot submit my previous result. Congrats to all teams! Way to bench! Many very good old skool overclockers here. Thank you for letting myself and my team compete with you. We were lucky this was not an all AMD show , amasing scores there Infrared ! Was a well deserved & clear win for Madshrimps! Congratz! Congrtaz also to Infrared for the AMD effort and to all participants around the world! I would like to congratz also my team for the 9th place and since no submission made under LN2 for Hellas O/C team this 9th place reveals a great effort under SS, H2O & AIR cooling. 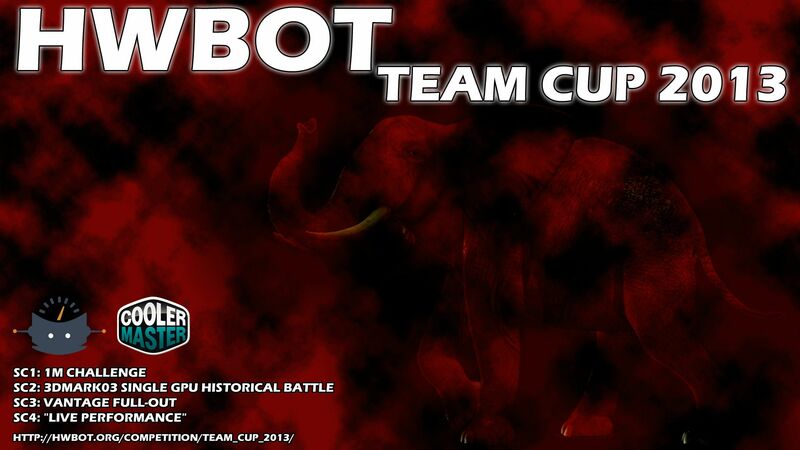 Most important of all is the fact that we managed to energize 2-3 idle members and more than three (3) new members that joined our team due to Team Cup! And now that all settled down I have a proposal for the next competitions. It's an interesting concept. Could easily turn into a team winning because they already had parts X Y and Z and didn't have to try to get them from 10k miles away somewhere though. Congratz to all the hard benchers and the winning team. Congrats to all participants, it was a great comp. I had a great time, thanks for the competition! This was my first attempt at oc an amd system. I thought it was easy mode then infrared started putting up scores....Nice work man!!! Congrats to all the participants and to the winning team! Can't wait till the next one! Congrats to all, it was a Great Contest. Congrats to all winners, was i nice competition and great competitors. There were made some great results, well done guys. Just so you know, we'll need a day or two to go over the submissions and finalize the rankings. Gratz for winers and all participants. And remember i'll be back! Muahahaha (very evil lough) you hear it ? A big congrats to team Madshrimps for the win and to all participants too! Some real killer results by many. Back from vacation and...what about the tie in 1M stage? My team is placed 3rd, but we have more 1st places in the substages - 6 vs 1. What is the rule if two teams tie for a given place? So on Live performance contest I have 80 points as another team. We are tie on 2nd place... What will be the result? Both of our teams win? Sent out the contact information to Cooler Master. Morphling and Lucky_n00b, you have PM . Did the winners already get an email for the prizes? I haven't got one, could you help me resend that email again? Thanks! Yup! We're coordinating everything right now. 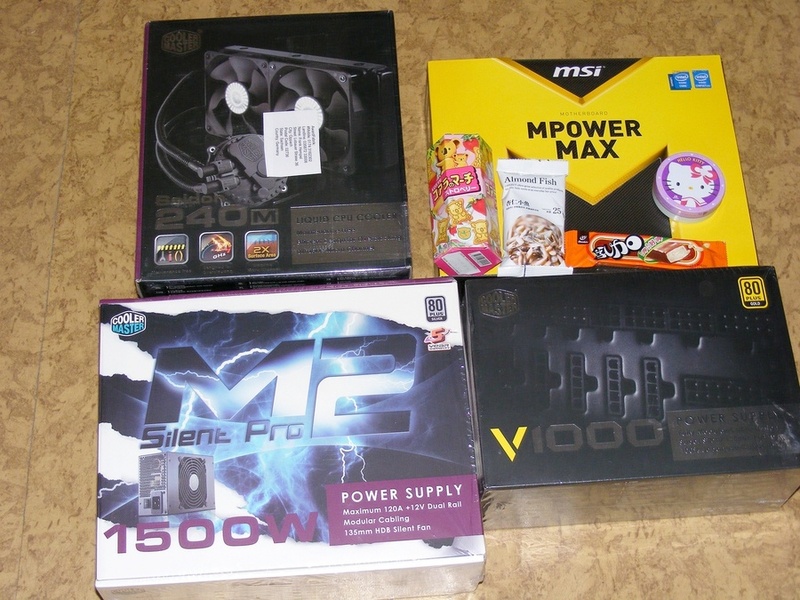 Madshrimps package arrived, thanks ASRock, ADATA, Cooler Master, G.Skill, MSI and Hello Kitty Sascha ! Nice set of prizes, have fun with those dude ! !